I finished 5th after a long day of playing pool. This was my first year playing this tournament and it is completely different from anything I have done before. 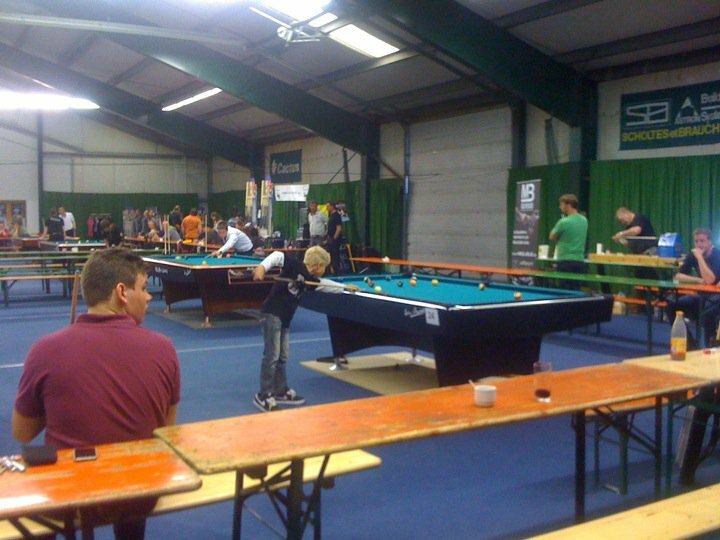 The tournament had a open division with over 300 players, womens with 38, girls with 5, juniors with 12 and pupils with 17. I played in the womens and the open division. The race in the womens was 4 on the winnerside and 3 on the loserside. Open divison race to 5 and 4 on loserside. 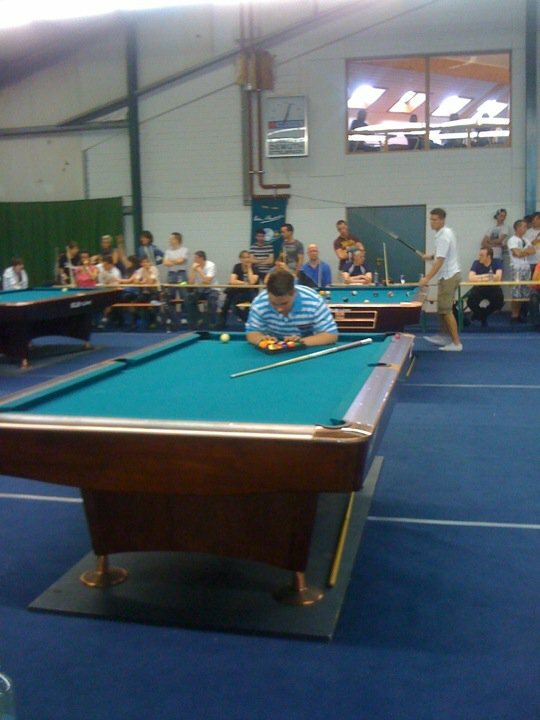 8-ball and winners break! I started with a win because my opponent did not arrive on time. Or so I was told. My opponent arrived 1,5 hour to late ( we had accreditation at 10) and suddenly I was told to play anyway. I decided not to use any strenght on arguing and just play. 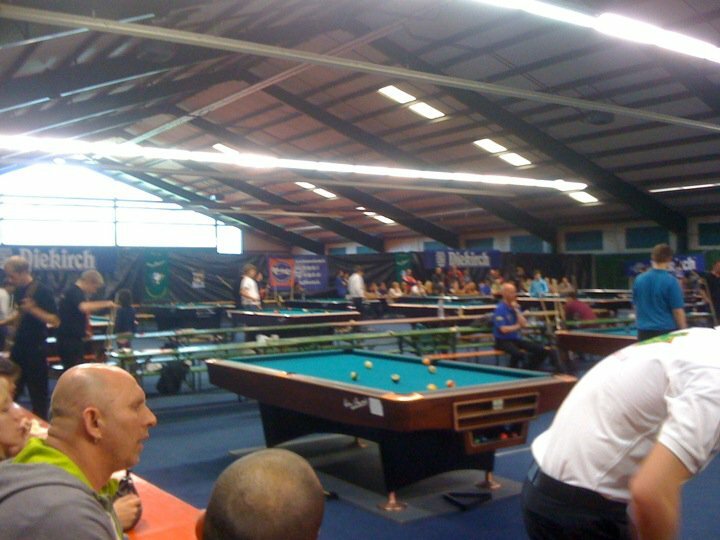 I played really well , beating Jasmin Michel, GER, 4-0. Next match I never got my head around to play and I lost 1-4 to Stefanie Müller, GER. I now faced race to 3 winners break on the loser side and I knew I had to pull it together. I won my next matches 3-0 (Sabine Bins, GER) 3-0 (Manting Cheng, NED) 3-0 ( Mealissa Rademakers, NED). Against Melissa I knew I had to play well and I did. She broke dry, I ran the table, I broke and ran and then broke and almost ran again. A small lack of focus made me rattle a ball in the corner and Melissa could come back on the table. She soon made a mistake and I could finish the game. This put me in the quarterfinals and single elimination. Quarterfinals I drew Ina Jentschura from Germany, one of the favourites. I won the lag, broke dry and she ran the table. She broke dry and left me nothing, not even a safety opportunity. 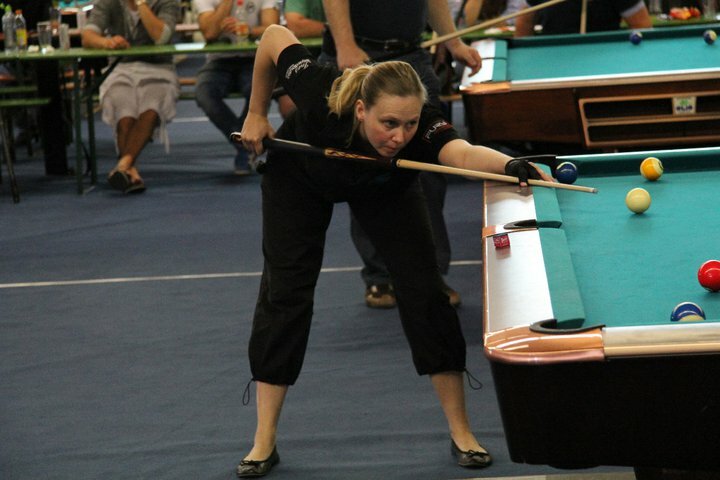 I tried a difficult shot in the side pocket, missed and she ran the table. Shen then broke and ran two more times to win the match. Not much I could do really. Ivanovskaia, GER, won the womens in the end, leaving Ina as the runner up. I really enjoyed the tournament though, and I am very please to see that I managed to cope with the low races and most important, playing against women which was the main reason I entered this tournament. Next year I will be prepared!! Olav Skrudland played in the juniors and open divison. He finished 5th in the juniors after loosing for the winner Ivar Saris, NED. Here he is playing in the open division.